Canadian qualifier Jeff Smith upset tournament favourite Robbie Green to reach the semi-finals at the BDO World Championships. Smith, 39, beat the 16th seed from Wallasey 5-1 to set up a tie with fourth seed Scott Mitchell on Saturday. Glen Durrant will face three-time winner Martin Adams in the last four after a 5-2 win over Darryl Fitton. The women's final will be contested by reigning champion Lisa Ashton and 20-year-old Fallon Sherrock. Ashton reached her third consecutive Frimley Green final with a 2-0 victory over Dutch thrower Sharon Prins and the 44-year-old from Bolton will aim to win her second world title on Saturday against Sherrock, the sixth seed from Milton Keynes. The youngster defeated Russia's Anastasia Dobromyslova in a deciding set, avenging her loss to the three-time champion at the quarter-final stage 12 months ago. Smith, who works at a car repair shop in New Brunswick, was the only overseas player in the last eight of the men's draw and his dreams of emulating fellow Canadian John Part, who won the title on his Lakeside debut in 1994, are still very much alive. A 160 checkout in the deciding leg of the fourth set put Smith 3-1 up in the match and it proved a pivotal moment. He told BT Sport: "I had a goal when I came here and that was to reach the semi-finals. I've accomplished my goal now and I've got nothing to lose." 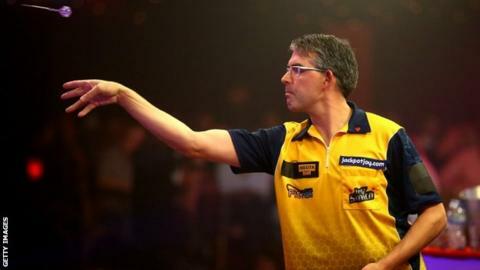 Seventh seed Durrant from Middlesbrough raced into a 4-1 lead against Stockport's Fitton, who threatened a comeback with five successive legs, before the 44-year-old closed out victory.